A view of the asteroid Ryugu taken by the Hayabusa2 spacecraft's laser altimeter after a month of measurement. That's no moon — it's an asteroid. New pictures of Ryugu, the target asteroid for Japan's Hayabusa2 landing mission, looks a bit like the infamous world-destroying "Death Star" spacecraft of "Star Wars" yore. And that's just one view of Ryugu recently sent to Earth by the probe. 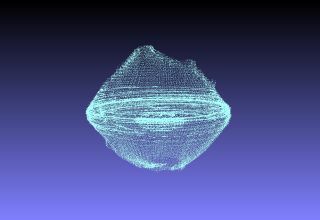 Hayabusa2 is still measuring Ryugu's shape, but preliminary data from the probe's laser altimeter instrument shows that the spacecraft looks like a spinning top. However, there's a large divot at the top of the asteroid, which is reminiscent of the small hole on one hemisphere of the Death Star. Generally, scientists can map the shape of a world by tracking changes in the trajectory of an orbiting spacecraft, which is pulled "down" toward the asteroid in places of higher mass. But this is a difficult measurement to do with Ryugu, which is very small (roughly 3,000 feet across, or 900 meters). While scientists refine Hayabusa2's trajectory, they're also picking up information on the surface to help prepare the spacecraft for several "touch-and-go" procedures to pick up soil and return it to Earth. Hayabusa2 will also deploy several landers and rovers to explore the surface — the first of those will approach the planet on Sept. 21 and Oct. 3. From pictures taken 12 miles (20 kilometers) above Ryugu's surface, Hayabusa2 recently mapped out hundreds of rock masses that each have a diameter of between 26 feet and 33 feet (8 and 10 m). The distribution of rocks on the surface of asteroid Ryugu — green marks indicate a rock that seems to be more than 25 feet (8 meters) across. "It turned out that there are more rock masses on the surface of the asteroid Ryugu than expected," JAXA officials said. Ryugu has more rocks in a given area than asteroid Itokawa, which was the target of the predecessor Hayabusa mission that concluded in 2010. Scientists are studying the masses closely to learn more about how Ryugu was formed, JAXA added. Another piece of the formation process comes through understanding what minerals are on the surface of Ryugu. A preliminary map shows temperature differences on the asteroid taken with Hayabusa2's infrared camera. Already, scientists can see a marked temperature difference between the northern and southern hemispheres of Ryugu, although the reason is still under investigation. So far, scientists say the highest-temperature areas appear to be around 212 degrees Fahrenheit (100 degrees Celsius), while the lowest-temperature areas appear to be room temperature. While JAXA did not define what "room temperature" means, generally that indicates temperatures of about 68 to 77 degrees F (20 to 25 degrees C). Hayabusa2 arrived at Ryugu on June 27 and is expected to make its first touch-and-go landing in October.